Please report pot holes, flooding, street lighting or pathway problems direct to 01296 382416 or online where you can also monitor progress. Fly Tipping should be reported on 01296 480771 or online. West Wycombe (not to be confused with West Wickham in Kent) is a small village situated along the A40 road, three miles west of High Wycombe in Buckinghamshire. The historic village is largely owned by the National Trust and receives a large influx of tourists - being the site of West Wycombe Park, West Wycombe Caves, St Lawrence Church and the Mausoleum on top of West Wycombe Hill. 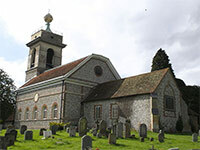 The Mausoleum, St Lawrence Church and the Golden Ball above West Wycombe village are impressive local landmarks, visually dominating the village and local landscape for miles surrounding. West Wycombe Park, Caves, Mausoleum and St Lawrence Church were all constructed in the mid-18th century by Sir Francis Dashwood, founder of the Dilettanti Society and co-founder of the notorious Hellfire Club. Although it is on the busy A40, the village centre retains much of its historical charm. It is mainly owned by the National Trust, and so has resisted modernisation. The High Street has a number of 'old-fashioned' shops (in appearance at least), as well as three pubs, some small offices, a well-used village hall and St Paul's Church. Just off the High Street is the village Combined School (ages 4–11). The population is around 1,300. Our thanks go to The Chiltern Society Photogroup for their kind permission to use members photographs.